Travel today was up Grizzly Gulch, passing through Silver and Days exiting out Toledo Bowl. There was about 4 inches of lighter density new snow, over yesterday's, which had set up into smush. The weather was a few degrees colder, but green housing once again made the new snow quite dense, as the day progressed. Oh yeah, it snowed a coupla times during the day, for an additional several inches. 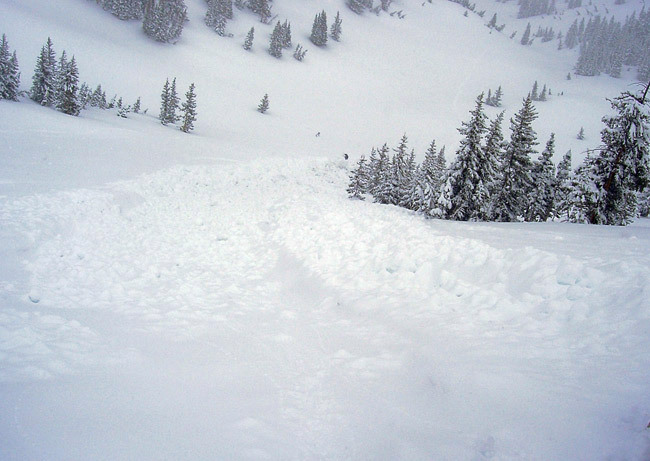 East bowl was skied without incident. We climbed back to the ridge traversing to Down and Out. 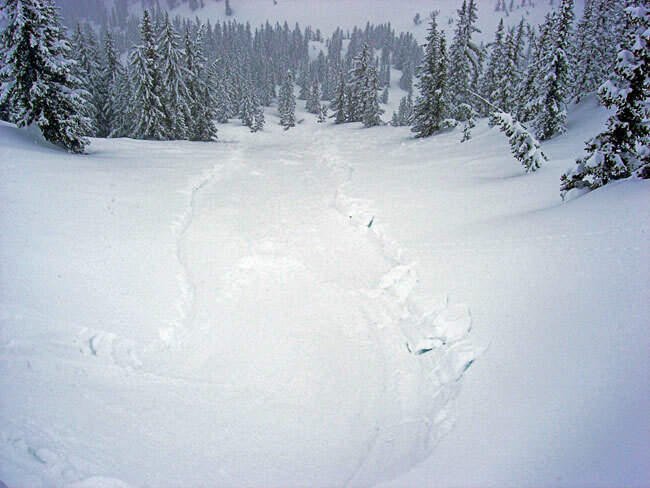 On the way, touching the bit of drifting along the ridge produced this in Over Easy. 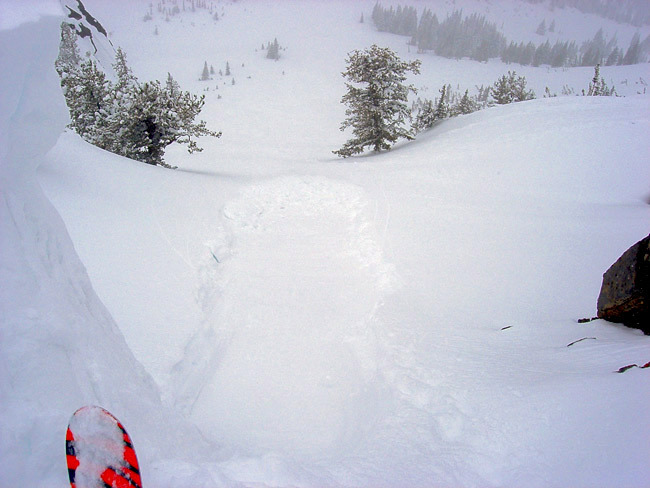 Started narrow but trenched and spread as it ran, entraining all the snow and going wide enough to eliminate thoughts of skiing. 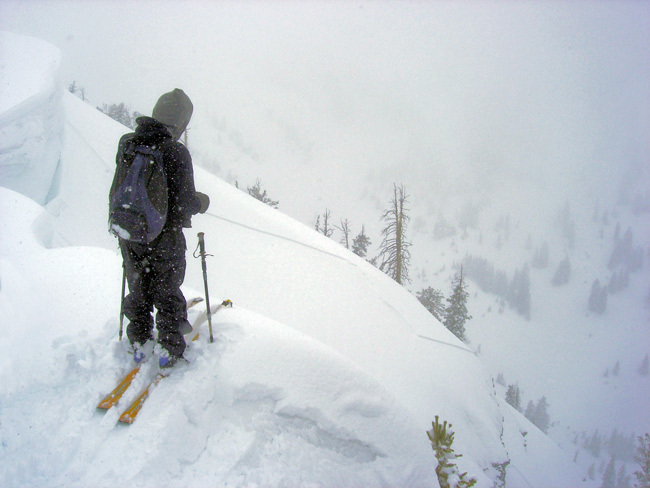 We skied Down and Out, finding no drifting and better bonded snow. 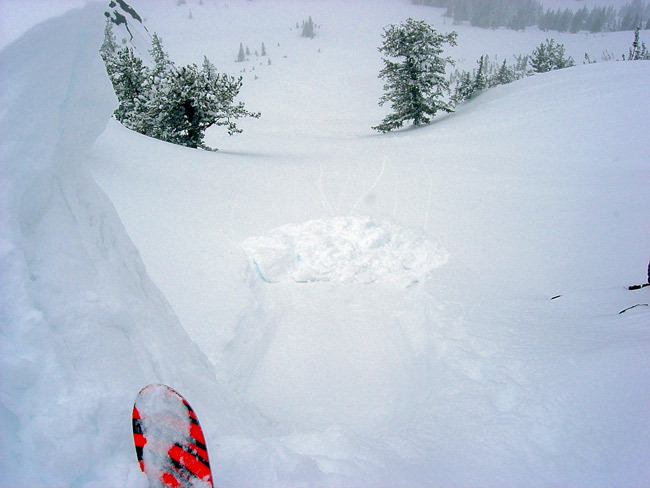 Climbed to the top of West bowl and traversed for a look down Oingo Boingo, finding a shallow natural. Initiated on the east facing flank, taking out the majority of the chute as it ran. 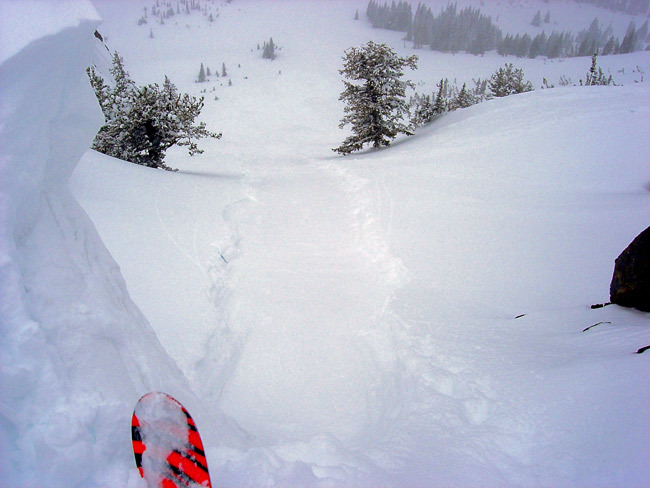 We skied West bowl, climbed back up, skiing down Oingo Boingo, first removing the rest of the remaining snow in the upper. The lower half was good skiing, after traversing away from the debri pile. 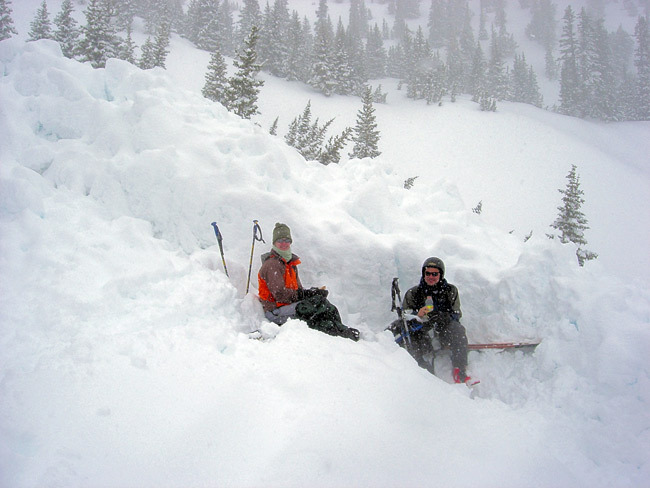 Ascent was to upper Days, where we found a couple having a leisurely lunch, next to another debri pile. When questioned, they claimed the slide was an old one, with the starting zone having a couple of feet over the crown. The common route with all the zig zags was taken to the ridge. We found the up track missing, taken out by the slide in a number of places. Well before reaching the ridge, it was determined the slide the couple was next to, had run this morning, with a couple of inches over the bed surface. Holy Toldeo ran the same way with a touch and is now a bed surface. The slide starting. The spread and debris barely visible at the bottom of the picture. Sking Toledo bowl back to Alta, was in thick and heavy snow, thicker and heavier with elevation loss. Another instability shower was occuring as we left, with the rain snow line about 6500 feet. Appears another day of this, before clearing. Temperatures rising for the weekend. Wear your helmut, when that happens.